Daily life, sport, age and excess weight can often cause pain in the joints and wear down cartilage. 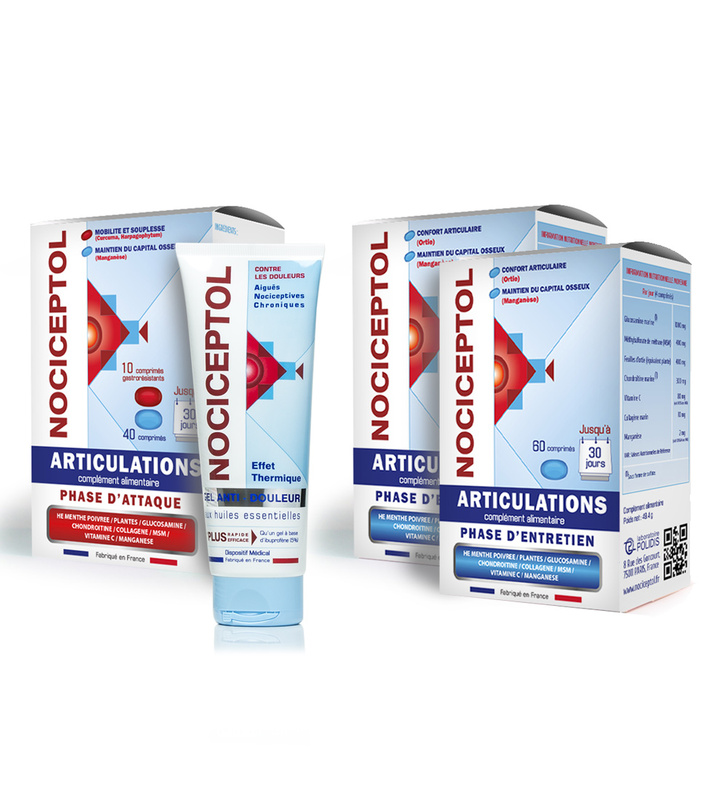 To help you maintain the mobility and well-being of your joints*, NOCICEPTOL® JOINTS is the best food supplement option. It is scientifically developed with very high-quality ingredients, which have been rigorously selected for their known properties. *Turmeric, harpagophytum and nettle, which sooth and improve the flexibility and mobility of the joints and tendons. Manganese, which helps maintain good bone stock and promotes connective tissue growth (bones, cartilage). Vitamin C, which promotes normal collagen growth to ensure the cartilage and bones function properly. Glucosamine, chondroitin and collagen, which are all of marine origin, and peppermint essential oil boost the formula. *Nettle, to help maintain joint comfort. Glucosamine, chondroitin and collegen, which are all of marine origin, and MSM boost the formula. traditionally used to help the joints function properly. known for its anti-rheumatic and chrondoprotective properties. stimulates the production of collagen in the bones and cartilage. known for its anaesthetic, painkilling and anti-inflammatory properties. known to help the absorption of turmeric and for its effect against rheumatism. known to help maintain joint comfort. helps maintain good bone stock and promotes connective tissue growth (bones, cartilage). known to help the normal production of collagen. all three are collagen components. known to keep the connective in good condition. Take 1 red pill every morning at breakfast with a large glass of water for 10 days than take 2 to 4 blue pills every morning at breakfast with a large glass of water for 10 to 20 days. Pain relief gel: Adults and children above the age of 7. Massage in gently, without pressing hard, 2 to 4 times per day to painful areas. After use, wash your hands. Close well after use. The active ingredients in the red pills are traditionally known for the quick effects. The red pills are gastro-resistant. The active ingredients in the blue pills are traditionally known for their effect over the long term. The food supplements must be taken following a healthy lifestyle and not used to substitute a varied and balanced diet. Do not exceed the daily recommended dose. Keep out of reach of children. For adults only. Not recommended for pregnant or breastfeeding women. Not recommended for persons with gallstones or ulcers (stomach or duodenum). Seek medical advise if you also take anticoagulants. Due to the presence of peppermint essential oil, ask a health professional for advice. Store in a cool place. Seek advice from your treating doctor if you have a history of seizures or epilepsy. Red pill : bulking agent: microcrystalline cellulose; turmeric root dry extract (curcuma longa); blackcurrant leaf powder (ribes nigrum); horsetail top growth powder (equisetum arvense); harpagophytum root dry extract (harpagophytum procumbens); bulking agent: calcium phosphate dibasic; anticaking agent: polyvinylpyrrolidone; peppermint essential oil; coating agents: hydroxypropylmethylcellulose, microcrystalline cellulose, acetic esters of mono- and diglycerides of fatty acids; black pepper extract (piper nigrum); anticaking agent: silicon dioxide, magnesium salts of fatty acids; coating agents: ethyl cellulose, ammonium hydroxide, medium chain triglycerides, oleic acid; colouring agent: carmin; coating agents: sodium alginate, stearic acid; colouring agents: paprika extract, titanium dioxide. Blue pill : glucosamine sulphate from crustacean shells stabilised by potassium chloride; bulking agent: microcrystalline cellulose; methyl-sulfonyl-methane (MSM); marine chondroitin sulphate (fish); nettle leaf extract (urtica dioica); anticaking agent: polyvinylpyrrolidone; ascorbic acid (vitamin C); coating agents: hydroxypropylmethylcellulose, microcrystalline cellulose, acetic esters of mono- and diglycerides of fatty acids; manganese gluconate; anticaking agents; silicon dioxide, magnesium salts of fatty acids; colouring agent: titanium dioxide; marine collagen (fish); colouring agent: brilliant blue FCF.